Satan's character is defined by his total separation from God. The "anti..." of God. Anti-Christ. Jesus Christ's own words identified the devil as "the enemy". If someone doesn't like it, they can take it up with the Son of the Most High God. When he successfully tempted Eve, and Adam subsequently rebelled, choosing the companionship of Eve over communion with God, human nature was transformed to the image of Satan rather than the image of God. Therefore, Jesus declared that "You of your father the devil...". All human beings are not "brothers and sisters". There are two kingdoms and two families. That is why the columns in the Matrix is labeled "Their" and "Our". All humans are born into this world as children of the devil, children of the flesh - but we are given an opportunity to be adopted. Those that receive Jesus are "born again" as the children of God. Those that reject Him remain the children of Satan. Jesus called Satan a "murderer" and a "thief" seeking to "kill and to destroy". 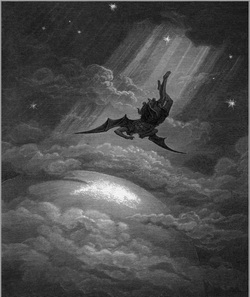 Satan, and those that serve him, portend to be enlightened, to be agents of all that is right in the world. Jesus called Satan a liar. The Apostle John wrote that all that deny Christ are liars. Two of Satan's nastiest devices are accusation and slander. When is the last time you had a bad thought, or said something injurious, about someone? When Christians walk after the flesh, rather than being led by the Spirit, our character resembles Satan rather than Jesus.